... in his powerful, mind-blowing, eye-opening Gift Of Money Seminar now available on 4 MP3s. Here is Rev. Ike at his 'outrageous' best – revealing to you his secrets for creating health, happiness, love, success, prosperity, and especially ... Money! During this seminar, Rev. Ike reveals powerful Universal Principles and techniques, which will MAGNETIZE your Mind for MONEY – and ALL THE GOOD you seek. ... as you join in and repeat with Rev. Ike the powerful affirmations that reach deep into your subconscious and condition your mind for money and all good! If you have ever wished that you had met the late, Great Rev. Ike in person, this is the next best thing! ... you'll feel as if he is talking right to you – and you'll talk right back to him along with the enthusiastic audience in these exciting, interactive, life-changing lessons on MP3. ... and you will get rid of all those 'money hang-ups' as you take part and interact with Rev. Ike – you will laugh, and shout, and repeat after Rev. 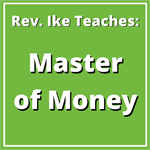 Ike the affirmations that re-program and condition your mind for success, prosperity and money. absolve money of all evil! and sanctify your mind for money! Rev. 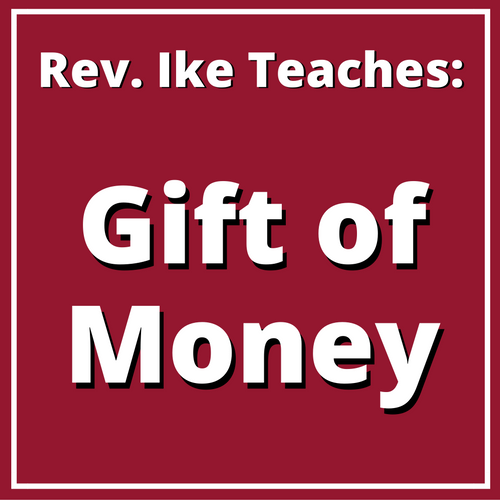 Ike teaches that one of the of the main reasons you don't have the money and all the good you desire is because of subconscious feelings of undeservedness. During this teaching you will get all those ideas out of your head that maybe you are not worthy – that you don't deserve to have money! You will come to see yourself as a beloved child of God who deserves all of God's riches and prosperity! The "Ten Commandments" of Money: 10 rules you must follow to attract and keep money and prosperity! Why you must never say or think "Money is hard to get"
With one bombshell after another – Rev. 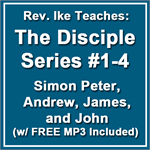 Ike challenges the theologians with his interpretation of the the Bible ... he teaches the Bible as a book of spiritual psychology – a book that is all about YOU and YOUR MIND! ... Rev. Ike's explanations of God-in-you, Christ, the Devil, Sin and Hell will knock your socks off – and awaken you to a whole new way of thinking! You will realize your own divinity – as a true child of God! During this workshop, you will come to understand the most powerful law of Mind Science – The Law of 'I AM'! ... and discover the ultimate truth, that "I AM money" ! From that moment on, your situations and conditions will start to be different – your life will never be the same! Order this 4-MP3 set today for only $25.95! Total length: 3 hours 51 minutes.